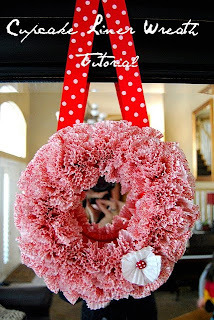 The Appraiser's Wife: cupcake liner wreath! so stinkin creative and would not cost alot of money: SCORE! :-) . i CANNOT wait to make one now! Click here to see how she made it. you could make the wreath ANY color. how cool is that!? Love this! It would be perfect for VDay! I love all of your recent posts, you find the cutest things. Glad you like the auction, I knew you would!